The statistic shows a gross domestic product (GDP) ranking by country in 2017. In 2017, Saudi Arabia ranked 19th with an estimated GDP of about 686.74 billion U.S. dollars. 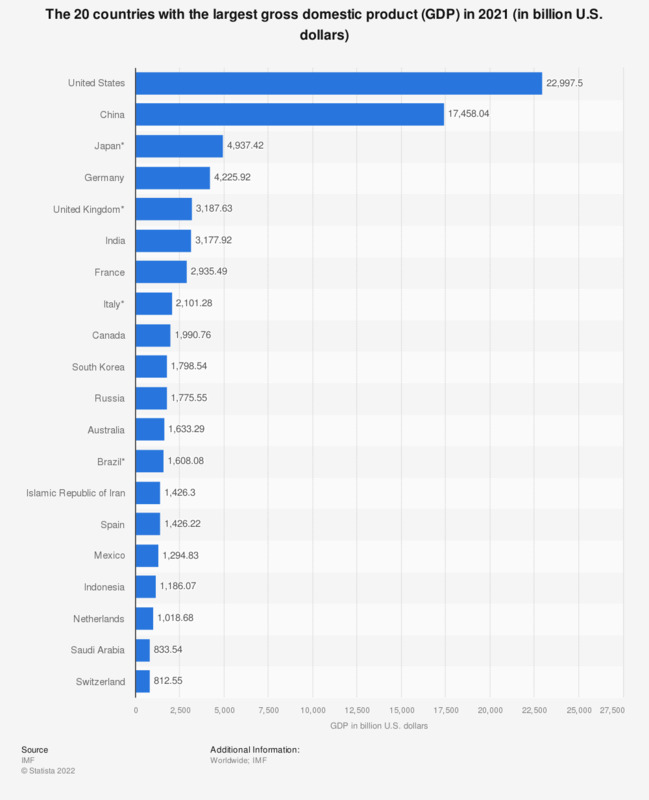 Global gross domestic product (GDP) amounts to almost 75 trillion U.S. dollars, with the United States making up more than 18 percent of it alone. Interestingly enough, China, one of the BRIC-states, is following closely. The BRIC- states (Brazil, Russia, India and China) are the four major emerging countries (click here for further information). It is also estimated that China will report the highest GDP in 2030, thus replacing the United States at the top. The gross domestic product of a country is calculated by taking spending and trade into account, to show how much the country can produce in a certain amount of time, usually per year. It represents the value of all goods and services produced during that year. Both industrialized and emerging countries account for approximately 50 percent of global gross domestic product each. For the purpose of clarity, figures have been rounded. Everything On "China" in One Document: Edited and Divided into Handy Chapters. Including Detailed References.